It's been awhile, I know. Sorry for the extraordinary gap, but between thyroidal madness and some bugs that snuck into my laptop, it's been difficult to get out here. Got a few new posts for you though, so here we go ..
First and foremost, I must tell you that at the end of February, the woman for whom I'd repaired a bracelet (see The Dark Side of a Sole-Proprietorship) came through with a check! On one hand ya could've blown me over with a whisper when it arrived, I was so surprised; on the other hand, it confirmed my belief that she just finally got around to sittin' down, writing the check and dropping it in the mail. It made me feel a whole lot better .. especially since I've had a couple of additional opportunities since then to send a package prior to receiving payment for it. I'm still inclined to believe Bruce Baker may be right to trust in people that way. OK .. new jewelry .. sorta. 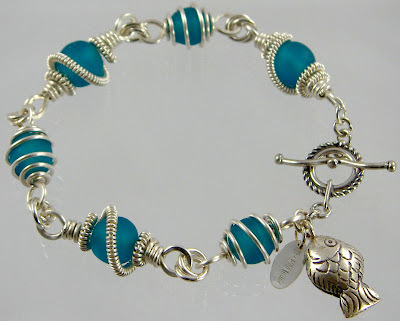 This is a turquoise version of the olive caged and coiled bracelet I included here a few posts down. They're real eye-catchers. I still plan on making some additional colors, but it's creatively refreshing to break away to something else ... in between. And here's a little bit of the "in between" .. three more fibulas. I apologize for the slightly out of focus images, but I took about 15 shots of each of the three and still couldn't get a clear, crisp photograph. I think I may have just been away from the camera a bit too long! This one, which I call Gold Coast (the name just bubbled up from inside my cranium .. no idea where it came from), is downright opulent!! 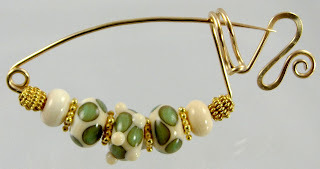 I got a little wild with the clasp this time and added that fancy wire wrap to spice it up a bit. The lentil and donut shaped beads are handmade lampwork glass, the pale brown nugget is smokey quartz. I call those three large connectors "garage door springs" . This picture doesn't give you a straight on perspective so you can see the "spring" aspect, but trust me, they look just like industrial springs. And they're pretty darn sturdy. I've previously used them as a base for bulky (i.e. heavy) charm bracelets, where they can't really be seen very well because they're smothered in beads. This is the first time I've used 'em right out there in the open. This version is a little bit too big for me and would probably fit a 6.25" to 6.75" wrist. I'm thinking of doing another with a lighter gauge wire. Oh, and there are earrings to match the lentil bead (which is about 15mm round) .. they're very light weight. I've got more, but as my internet connection is dial-up, I'm sensitive to others in the same situation .. and for those who have subscribed to receive new posts via email, I know how long it takes for all those images to load. So I'll include the rest in another post. this is absolutely beautiful! 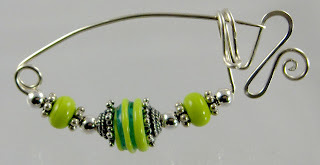 can you recommend a book or other source for learning the wire bead technique and the garage spring? Egads .. I have about eight feet or more of jewelry making books I've collected over the years and I've no idea where I might've learned any of these tricks .. but I'm thinking the garage spring came from a Connie Fox piece in one of the many jewelry trade magazines I receive. The "caged and coiled" beads were probably Sherlyn Miller's. Just register and you'll be receiving more information than you've got time to deal with.